Having dinner with the Wine Maker of the Year for 2012 is quite an event. The odds of having a chance to meet and talk with the wine maker of the year, is slim, with so many great wine makers from around the world. For me there is also a dash of synchronicity happening as I one week before reviewed a few of this wine maker’s wines. Who is the wine maker? To meet this wine maker, you would need to board a plane and fly to Mendoza, Argentina. There you would meet Bodega Norton’s Chief Winemaker, Jorge Riccitelli. He was awarded “Winemaker of the year 2012″ by Wine Enthusiast magazine. Jorge is a very distinguished, 63 year old, silver haired man, with a big smile, and what I can tell a good sense of humour. Unfortunately he speaks Spanish, not English, and my Spanish is quite sparse (but I’m working on it). To aid in the communication with his English speaking audience, he brought along Maria Julia Cahiza, their Key Account Manager for North America to do the translations. 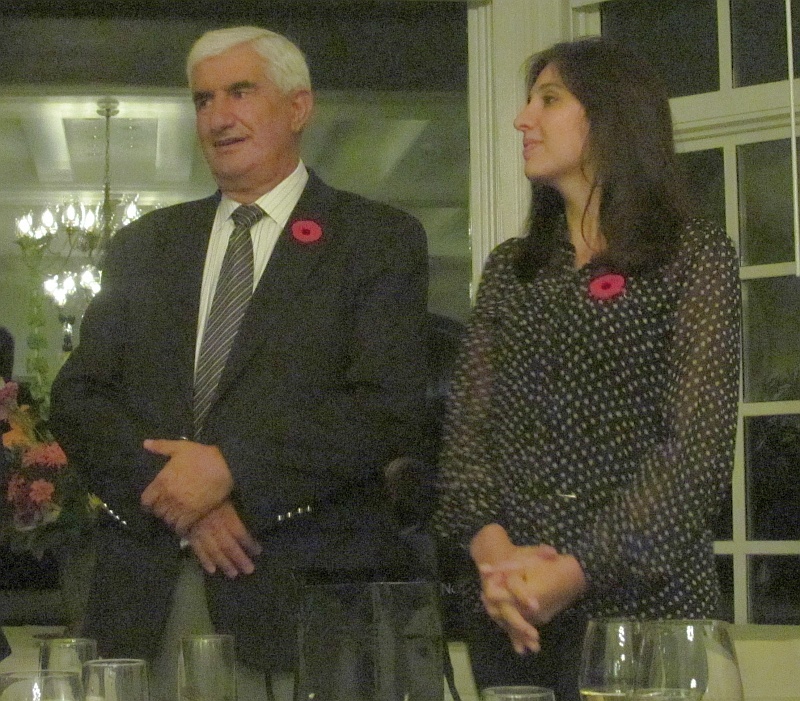 The dinner was held at the top notch Capilano Golf and Country Club in West Vancouver. Jorge started with Bodega Norton in 1989 at the same time as Gernot Langes-Swarovski from Austria, who bought the winery. He has made his name with wines such as their Privada (the wine made originally for the family and their friends), and their premium Gernot Langes. Starting a dinner reception with sparkling wine is always nice. We enjoyed a Chardonnay-based sparkling, the Cosecha Especial Extra Brut and a lightly oaked Reserva Chardonnay. We found out that the sparkling wines only started 10 years ago for Bodega Norton, and it was meant for their friends. Bodega Norton is now the second largest sparkling wine producer in Argentina producing 2.5 million bottles for their domestic market. Jorge noted that their sparkling wines are meant to be drunk the same year as they are produced, so enjoy them without guilt now. The scallop ceviche was very tasty and went nicely with the sparkling wine. The Reggiano & Pancetta Churroz was a savory riff off of the sweet Churroz that are common in South America and Mexico. The Reserva Chardonnay 2012 had light aromas of pears and vanilla. Light plus body with light tropical fruit, pears and vanilla flavours, and a hint of spice on the finish. Smooth mouth feel but you could still detect the acidity. As we sipped the Reserva Malbec 2010, Jorge mentioned to us that Argentinean Malbec is known for the sweetness (softness) of the tannins, which I agree. This wine had aromas of blueberies, ripe raspberries, black cherry, black current, other black fruits and hints of vanilla, oak and nutmeg. Dry and round in the mouth but not quite soft due to the acidity in the wine. Raspberries, black cherry, black currant, vanilla and some flowers (rose) and liquorice flavours on the palate. To this wine we had the Wild Mushroom & Sardo Raviolini. The spicy chorizo and rosemary oil stood out in flavour in this dish. The Malbec brought out more of the spice from the chorizo and added more texture/mouth feel to the dish. 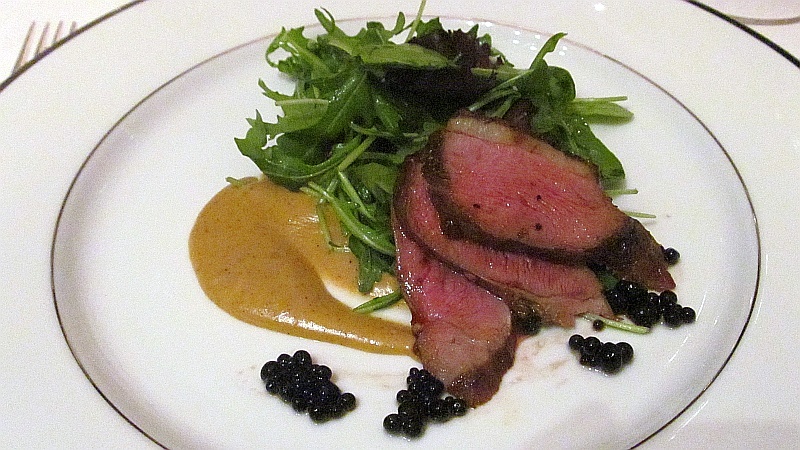 The Tamarind BBQ Duck with Smokey Plantain Crema, Arugula, and Balsamic Pearls was a very interesting dish. The duck with done nicely medium rare and the Balsamic Pearls was a first to me, adding some acidity and sweetness to the dish. The smokey plantain was another flavour component that I think went well with the oak in the Privada. The Privada 2010 was smooth and full bodied, with licorice, dark fruit spice, ripe plums and dark cherry flavours. This is a blend of Cabernet Sauvignon, Malbec, and Merlot. Jorge mentioned the Cabernet adds body, Malbec offers “sweetness”, and Merlot provides floral notes. The highlight of the tasting for me was the Gernot Langes 2006 paired with the Mixed Grill of Lamb Lion Chop, Beef Tenderloin, Pork Ribs, Chimichurri Meat Balls. It was like having a mini version of a meat plate from an Argentinean churrascaria, including a beautiful bottle of wine. The Gernot Langes is a blend of 70% Malbec, 20% Cabernet Sauvignon and 10% Cabernet Franc. ; quite a different blend, with the Cab Franc component. Jorge thinks that Cabernet Franc has great potential in Argentina, so I am going to keep my eye out for more wine from Argentina with Cabernet Franc in it. This wine was opaque garnet to the rim, very intense looking. Purple fruit and vanilla on the nose. Medium plus body, silky with ripe purple fruit flaovurs along with cassis and licorice. Spice and vanilla come in on the mid palate and tannins on the finish. This is a very high quality wine and very tasty. My favourite wine of the evening. 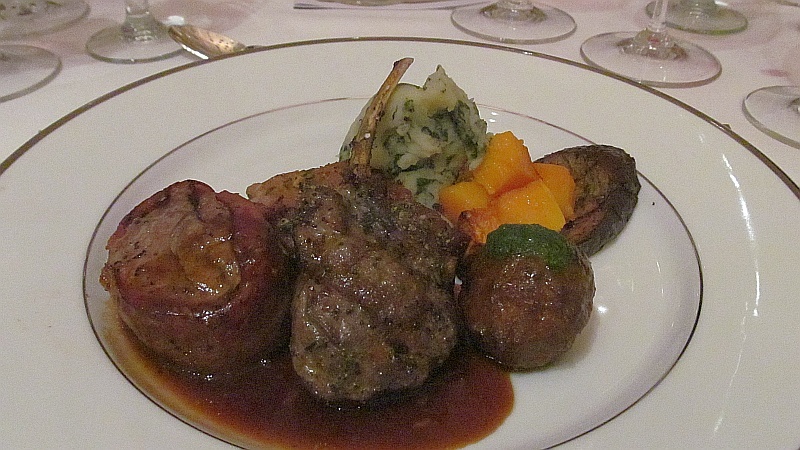 The beef tenderloin was so soft and was wrapped in wonderfully smoked bacon. The meat just melted in your mouth and helped soften the tannins in the Gernot Langes. The spice from the pork ribs also paired nicely with the Gernot Langes. I did keep a little of the other wines and tried them with this dish and found that the lighter bodied, higher acid Reserva Malbec 2010 also paired nicely with this dish. 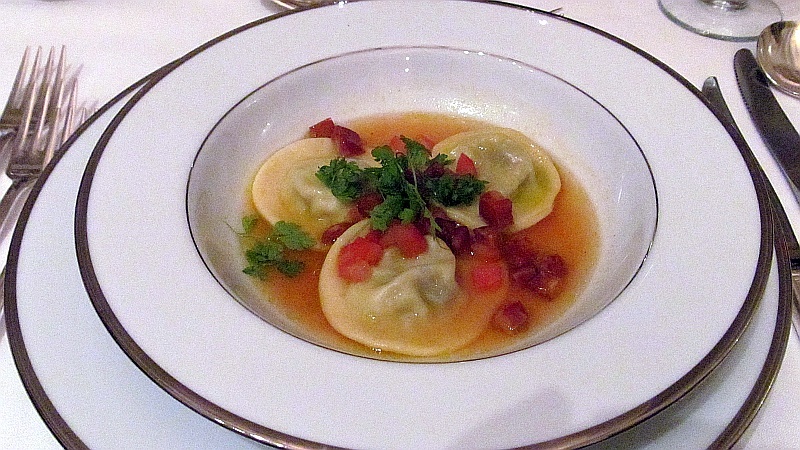 It provided a completely different feel to the dish due to it’s lighter body and the acidity. 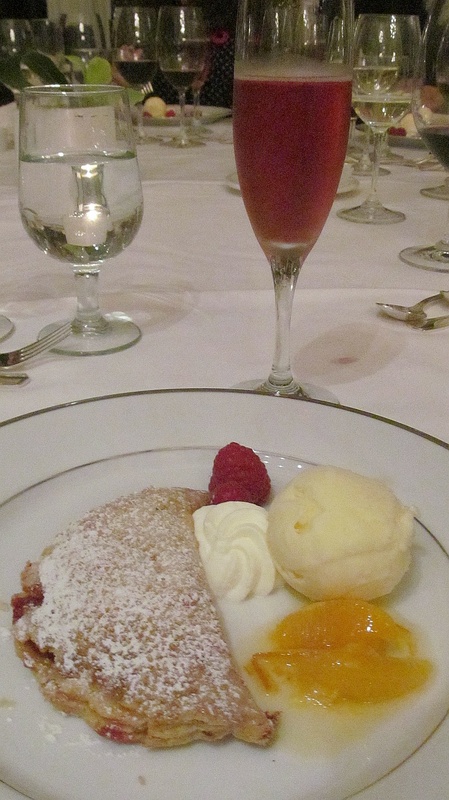 The final pairing was the Late Harvest Rose with the Raspberry “Empanada”, Goat Cheese Gelato and Citrus Confit. This is a sweeter rose, medium body, high acid, with light body.Very flavourful with lots of sweet red cherries, and strawberries together with a slight herbal whiff. On the nose you pick up nutmeg, oranges and strawberries. The raspberry empanada was not overly weet, and had a nice flaky pastry. The rose dances on top of this dish. A very enjoyable way to end a meal. Overall a very enjoyable evening, with wonderful wine from Bodega Norton and superbly cooked food from the chefs at Capilano Golf and Country Club. Thank you to Peter Mielznski Agencies (PMA) Ltd for allowing me to partake in this event with them. Here is my review of 3 Malbecs from Bodega Norton that I had written earlier, with more detailed notes on the Reserva Malbec and the Privada.